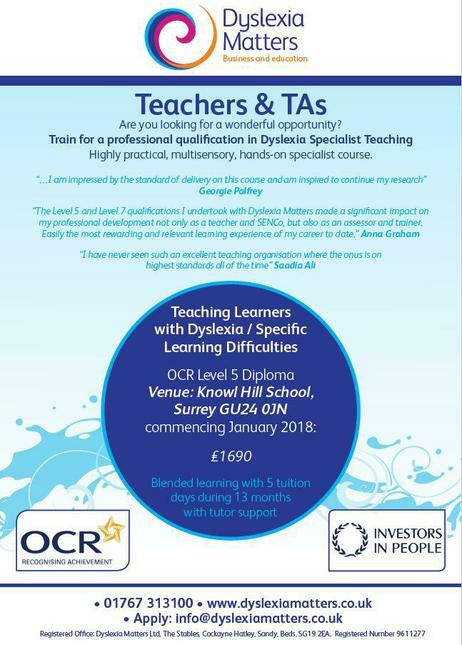 OCR Level 5 Diploma in Teaching Learners with Dyslexia/Specific Learning Difficulties (SpLD) . It will be run by Dyslexia Matters who ahve many years' experience and an excellent reputation. ".. a fascinating course delivered in a flexible and relaxed way...run with enthusiasm and excellent communication from tutors with prompt feedback." OCR student. See attached poster for more details.